Leigh Wood expects to be British featherweight title holder by the end of 2016 and says it is the next step on his way to becoming a world champion. 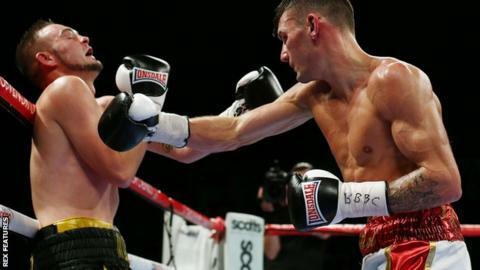 The 27-year Nottingham fighter beat Josh Wale in October in what was billed as a British title eliminator and now has champion Ryan Walsh in his sights. Walsh will defend his title for the first time in January and Wood is eagerly awaiting his chance. "Ryan Walsh is on the hit-list," Wood told BBC Radio Nottingham. "But he has a voluntary defence in January so there is nothing I can do about that. He has freshly won the title so is allowed to pick someone in the top 10 to defend it against. "I am not going to be waiting around and not boxing for six or seven months so hopefully I can fight for something else in the meantime - maybe the Commonwealth." Josh Warrington is the Commonwealth featherweight title holder and Wood says that could well be his next fight. "I have an option to fight for the Commonwealth title so maybe I could be steered towards that," said Wood, who has won 12 of his 13 professional fights. "I am ready and I will see what happens in the new year. "I definitely want the British title. But I will not sit around and wait for a shot I need to keep busy and keep my fights competitive." And beyond domestic glory, Wood, who is heading to Mexico for a "working holiday" packed with training and sparring, has the world stage in mind. "There is no limit," he added. "I am a confident person no matter what I do. "I think I will win a world title. I have the ability. I need to keep working hard an doing what I am doing. Bit by bit I will get there. "Before the end of the year I will have that British title."